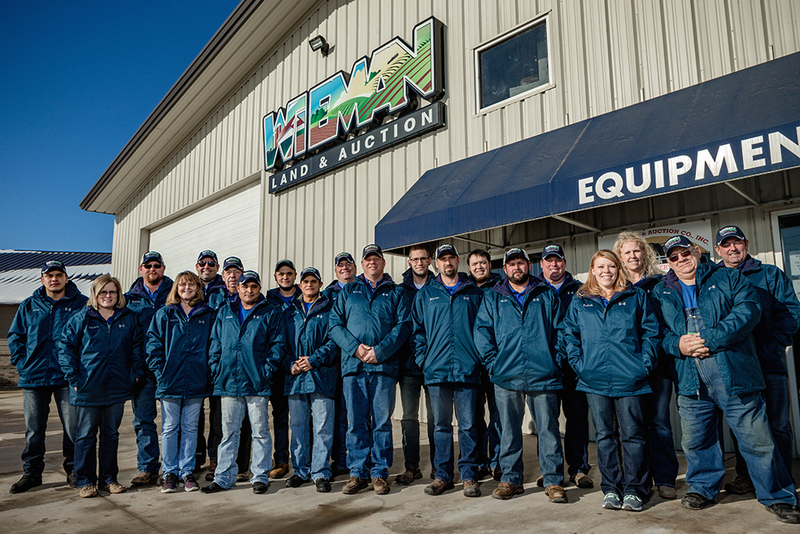 Wieman Land & Auction Co. Inc. is a third generation family owned auction company that was started in 1949 by Earl Wieman. After Earl’s service to our country, he returned back to South Dakota in 1946 and began farming and selling Wayne’s feed. Earl was encouraged to attend auction school by several of the local auctioneers and family members. This began a legacy that has lasted for nearly 70 years. From the humble beginnings of Wieman Land & Auction Co. Inc. to the company that it has evolved into today, one thing still remains the same it’s the PEOPLE that represent us, and the customers that we deal with year after year that keep this company continually changing and evolving. Earl impressed on all of us the importance of maintaining your word as your bond and the power of a handshake. Earl’s two sons, Gary and Rich Wieman, joined the company after they completed auction school with Gary graduating in 1967 and Rich in 1974. At present, Gary’s two sons, Kevin & Mike, and Rich’s two sons, Ryan & Derek, are all employed in this family business. Today we employee 21-full time employees and have several part time support personnel. This large workforce allows us to handle any size sale along with maintaining our day to day operations. Marlo Wieman who is a cousin to Gary and Rich moved his implement dealership to our lot in 1994. This created Wieman Machinery Auction, a subsidiary of Wieman Land & Auction. This branch is a non-franchise farm equipment dealership that buys, sells, and trades equipment of all categories daily. Along with private treaty sales, we host 5-consignment events annually and several internet only auctions at our machinery lot. Which we refer to as the Machinery Mall of South Dakota. Wieman Auction has many moving parts that include a trucking company, repair shop, body shop, detail shop, plus a full service auction company that offers both traditional live auctions, live auctions with simulcast internet bidding, and timed internet only auctions. We believe the technology advances and changes in the auction profession have created exciting new avenues as well as new challenges as we move into the future. Now more than ever, consumers demand more information and we are committed to staying cutting edge with the technology and services our company offers. Whether you have land, farm equipment, personal property, or anything else of value, when the decision is made to sell consider putting all of our resources and years of experience to work for you. It is our goal in every situation to conduct good honest business with fair and equal treatment to all buyers and sellers. Give us a call, send us an e-mail, or stop in and see any of our staff we will answer any questions you may have!